– Reaction 1: People who know the musical’s sacred lore as one of the biggest flops in musical theatre history and are incredibly pumped to find out how truly bad the show was/is. Both are valid responses. 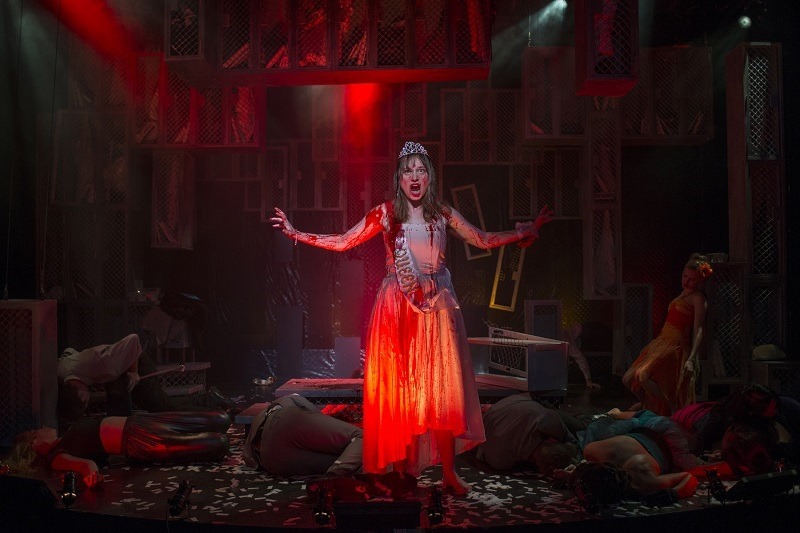 However, I’m mostly pleased to report that Carrie: The Musical, as presented in the Chicago-area premiere by Bailiwick Chicago, is a fine production of an ok musical. Sure, the show was a “so bad it’s good” mess when it opened — and quickly closed — on Broadway in 1988. Despite landmark performances from a young Linzi Hateley and a ferocious Betty Buckley, the show drowned in its own excessiveness and obscene misdirection and became a cult classic survived through YouTube clips and audio bootlegs. Then, in 2012, the musical’s authors retooled the show to become a more intimate exploration of teenage angst, fears and love, with the telekinetic undertones taking a backseat for emotional truth.